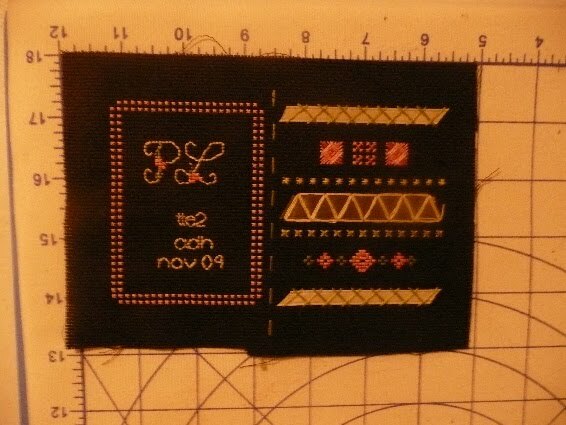 I saw on the TTE2 blog that Patti has received her needlebook! I’ve seen on a number of the UK blogs that there was a postal strike that started right around the time I mailed this, so I was nervous. But I’m glad it’s arrived safely! For Patti, I was inspired to do a “sampler” style, incorporating ideas I’d been gathering from that Encyclopedia of Needlework. Unfortunately, I didn’t take any finish-finish pics. I seem to have a problem with that! But if you click on the TTE2 link above, it will take you directly to Patti’s post, with pics of the finishing. This was my first needlebook, and I had so much fun working with the stitches and materials, that I also designed a matching scissor case for her, and sent her the pattern with some of the Aida I used. Very brave stitching on dark material. Lovely work.